Leave it to me, as usual, to say I’ll post something and then just never do it. Oi. 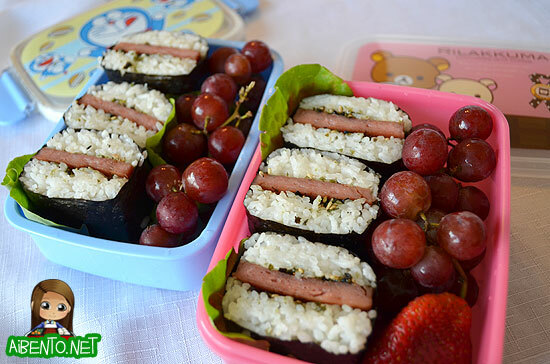 This is a photo from the first day of summer fun, when I made the kids spam musubis. I have found, through trial and error, that the kids will waste food if I give them two whole spam musubis and they’ll come home complaining about how hungry they are if I only give them one. So, I tried out cutting three musubis in half and giving them three halves each. Worked out perfectly and all of the musubis were eaten! You can see the cover of the pink Rilakkuma box that I got from Modes4u (read my review of it here). As I mentioned, last week Buddy killed another bento box. 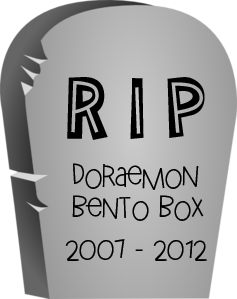 I had this one since my first year bento blogging, so here’s a little memorial for it. I’ve stopped since stopped giving him bento boxes with handles. By the way, since he only busted the cover, I kept the bottom to use as a food container for leftovers and stuff.